Patrick and Alex are canceling all of their travel plans. Take part in the F This Movie! F Scary Movies! Challenge II! 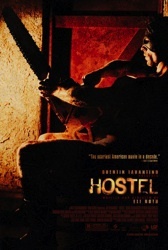 I haven't seen Hostel or Hostel 2 and never had the desire to. After listening to this podcast, I'd like to watch Hostel with your thoughts in mind, but it may still have to be through my fingers. With these types of movies it's so hard to suspend disbelief and i had a physiological response just from hearing the descriptions of some of the torture scenes. I so don't blame you for not wanting to see the Hostel movies. I would suggest that the first movie is better than you might expect, but I'm not sure you're missing anything by not watching it -- especially if you know ahead of time that it's probably not up your alley. Still, I appreciate you wanting to give them a chance! And thanks for writing! And listening! You rule. Loving the "Don't Look Now" reference in Hostel. Talking about a drowning accident while following a red jacket through the maze-like town. coincidence?